The SU-76M is a Rank II Soviet tank destroyer with a battle rating of 2.7 (AB) and 2.3 (RB/SB). It was introduced in during the Closed Beta Test for Ground Forces before Update 1.41. The SU-76 is a fairly versatile Rank 2 assault gun, equipped with a very good gun for its BR of 2.3. Overall, the Su-76M is to be played defensively, with the ability to carry out some sneaky, cautious flanks if given a decent opportunity, but it should never get into prolonged fighting up close. A two-versus-one situation is very unfavourable for this vehicle. 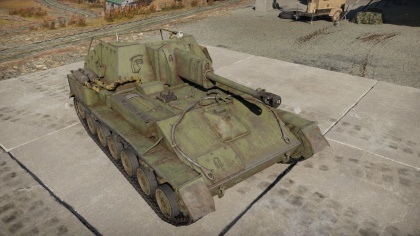 The further research will then lead you to its successor – a fully enclosed SU-122, carrying more armour, but mainly the massive 122 mm howitzer. Belly armour is 7 mm thick. The rear superstructure does not cover the entire crew compartment. A 25 mm plate of armour separates the driver's and engine compartment to the rear fighting compartment. Ammo rack layout of the SU-76M. As is common with Tank Destroyers, the SU-76M needs to be handled with care. Not only does it not have a rotating turret, it has an open top and practically no protection from behind. Therefore, when an engagement's complexity evolves and the Su-76 is surrounded, there is little that can be done to survive. One well placed hit to its rear will knock out a good part of the exposed crew, even machine guns can do the job of eliminating both loader and gunner. Therefore, it is crucial to remain at a distance from the enemy, perhaps even seek the cover of trees for protection against low-level attack aircraft, and to only ever give the front side to an enemy. The fact that this vehicle does not have a turret not only means that it is not effective when fighting more mobile enemies attempting to flank, it also means that placing your armour at an angle is not a viable strategy to increase relative armour thickness and stay more protected, since the gun's limits for horizontal traverse mean that any significant angle of the hull towards an enemy will make make it harder to keep the enemy in sight. What can be done is to fire a shot and, immediately after, angle the hull whilst reloading, to then return to facing the enemy to fire another shot. However, hiding whilst reloading is the most sensible choice. Unfortunately, the SU-76 has fairly poor mobility, handling, and a vastly different gun when compared to its smaller and more mobile cousin, the Zis-30. You could compare the Zis-30s gun to a nail. It's gun will pierce through anything at its rank, making most tanks armour seem like paper, but sometime its internal damage will be minimal and confined to the area that it penetrates. 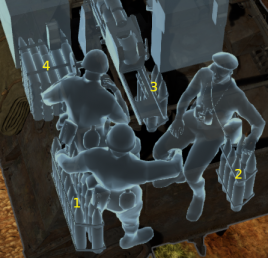 The gun on the SU-76 is more like a hammer. The sheer force of the shells will cause huge amounts of trauma to a target upon penetration. The SU-76 is also more well armoured than the Zis-30 and provides much more protection to the gunner crew, especially from smaller caliber rounds (Unless fired from the rear). Given its poor gun depression and velocity, the SU-76 should be used as a mobile brawler and ambusher. It is well suited to performing ambushes in urban areas. The high HE filler of the 76mm shell makes it capable of OHK'ing nearly all enemy armour at its 2.3 BR. A minor issue with the SU-76 is that it has no defensive machine gun, meaning that responding quickly to SPAA is difficult. The gun in itself is what makes the SU-76M a good vehicle, all its other characteristics are less than impressive. The variety of ammunition is a definite pro for this SPG, its APCR and HEAT shells being effective even at higher ranks, giving this humble tank destroyer the ability to down hightier tanks like the Tiger H1. Recently, the much more effective late-war BR-350B ammunition has been added to the SU-76M's ammunition options. It features noticeably more penetration and a better fuze in exchange for somewhat less explosive mass. Despite this you will often destroy most enemies in one shot when you penetrate. Once unlocked, the SU-76 is quite capable of dealing with any tank it is likely to see from the front, though you may have to swap ammunition often to deal with different targets. During the interwar years, the development of self-propelled artillery was practically nonexistent in the Soviet Union. Those few projects, based on the chassis of T-26 light tank, such as SU-1, AT-1 or SU-26, were eventually cancelled, and the Red Army entered the Second World War entirely without a dedicated self-propelled gun. The situation changed after the German invasion in 1941, and vehicles such as the SU-152 or SU-122, based on the KV-1 and T-34 tanks respectively, were developed. In November 1942, the State Defense Committee then ordered the production of a light self-propelled gun, built on the chassis of a light tank and armed with a 76.2 mm gun. The T-70 light tank chassis was chosen, as the other light tanks, the T-50 and T-60, was already out of production. The chassis had to be modified for this role, so it was lengthened and had one additional pair of road wheels added to the design. The armament, the 76.2 mm divisional M1942 gun (also designated ZiS-3), was mounted in a fully enclosed case mate. The gun was positioned at the rear, with the transmission being mounted frontally. The vehicle was designated SU-76 (Samokhodnaya Ustanovka, “Self-Propelled Gun“), and the production was issued to the No.38 Factory in Kirov and started in December 1942. However, after only a couple of hundred vehicles were produced, the production was halted due to serious mechanical problems and other issues. The power train consisted of two GAZ-202 automobile engines, with each powering one track. However, there was no synchronization gear, so the driver has to control both engines simultaneously, which was an extremely difficult task. This arrangement also caused strong vibrations, which were the cause of frequent engine and transmission failures. The second biggest issue was the enclosed crew compartment, as it was very cramped and offered only a little space for crew members to work properly. The vehicle thus had to be modified, firstly the roof of the crew compartment was removed, improving the access to the gun. The power train was also changed, receiving the more powerful GAZ-203 engines, each producing 85 horsepower, which were now mounted in tandem on the right side of the vehicle, propelling a single drive-shaft. The modified vehicle was designated SU-76M, and its production was resumed in early 1943. More than 14,000 SU-76M’s were produced between 1942-1945, making it the second most produced armoured vehicle in Soviet Union after the T-34 tank. In its intended role, the SU-76M replaced earlier infantry support tanks and was very welcome to Soviet infantry units as it provided them with a light and mobile universal support weapon. The vehicle was meant to be part of three battlefield roles - a light assault gun, a mobile tank destroyer, or a mobile artillery gun as the weapon could be fired indirectly at a range of 17 km. The vehicle was fairly lightweight and produced low ground pressure, enabling it to pass through terrain unsuitable for heavier vehicles. Tts gun could utilize multitude of ammunition types, aside from standard high explosive ammunition, it could use fragmentation, shrapnel, incendiary and smoke rounds. As a tank destroyer, the gun was sufficient against German light and medium tanks such as Panzer III or Panzer IV. The introduction of the APCR and HEAT rounds then enabled SU-76M units to engage even heavier Panther and Tiger tanks with some success, though crew manuals instructed the gunner to try to hit the tracks or gun barrels before these rounds were made. The vehicle also proved itself effective in an urban environment, where it was used as an assault gun for direct fire against enemy strong points and fortifications. The open-topped casemate made the crew vulnerable to snipers and hand grenades, but it also made the communication between vehicle commander and any accompanying infantry easier. Plus, it was found that the open compartment actually helps against the German infantry anti-tank weapon Panzerfaust, where a closed space would ensure the death of the crew members from the blast concussion amplified in the closed space. 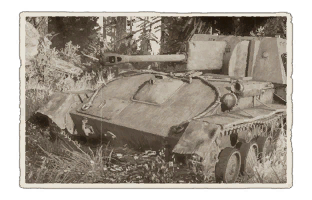 The SU-76M's low ground pressure from its weight made it one of the only Soviet vehicles able to operate in swampy terrain, which was extremely helpful during the Belarus Campaign in 1944, allowing the vehicle to attack through swamps in raids. This allowed the Soviets to bypass German defensive areas on more suitable terrain with support of an assault gun accompanying the light infantry. One famous SU-76M user was Rem Nikolaevich Ulanov, who was famous World War II veteran and his crew called their SU-76 the "Columbina". After the end of World War II, the SU-76M was phased out of production, but many of them were exported to other countries, such as China, Cuba, North Korea, North Vietnam or Czechoslovakia, where they would be used in conflicts such as the Korean and Vietnam War against the US and their allies. Due to the large quantity produced and usage after World War II, many are found in intact conditions today in various locations around the world. Some could even be found as war monuments for the Soviet and German memorials. Skins and camouflages for the SU-76M from live.warthunder.com. This page was last edited on 13 January 2019, at 17:36.